Marked by Fire: Stories of the Jungian Way is a soulful collection of essays that illuminate the inner life. When Soul appeared to C.G. Jung and demanded he change his life, he opened himself to the powerful forces of the unconscious. He recorded his inner journey, his conversations with figures that appeared to him in vision and in dream in The Red Book. Although it would be years before The Red Book was published, much of what we now know as Jungian psychology began in those pages, when Jung allowed the irrational to assault him. That was a century ago. How do those of us who dedicate ourselves to Jung’s psychology as analysts, teachers, writers respond to Soul’s demands in our own lives? If we believe, with Jung, in “the reality of the psyche,” how does that shape us? 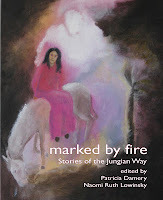 The articles in Marked By Fire portray direct experiences of the unconscious; they tell life stories about the fiery process of becoming ourselves. Contributors to this edition of the Fisher King Review include: Jerome Bernstein, Claire Douglas, Gilda Frantz, Jacqueline Gerson, Jean Kirsch, Chie Lee, Karlyn Ward, Henry Abramovitch, Sharon Heath, Dennis Patrick Slattery, Robert Romanyshyn, Patricia Damery, and Naomi Ruth Lowinsky. Large Format - Trim Size 9.25" x 7.5"
Fisher King Press publishes an eclectic mix of worthy books including Jungian Psychological Perspectives, Cutting-Edge Fiction, and a growing list of alternative titles. You need to be a member of Depth Psychology Alliance to add comments! Excellent! This book, due out in the Spring, is the July Book for the new Depth Alliance Online Book Club! Can't wait to read it!